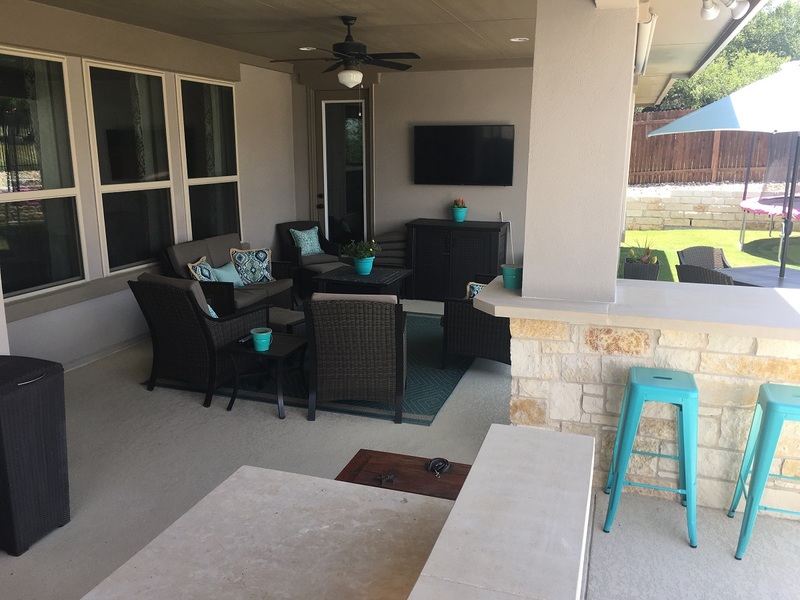 A trend we’ve seen growing in the Austin area is that of new home buyers lining up their Austin patio builder (that’s us) before they even close on their new home. Today’s featured project is one such case. 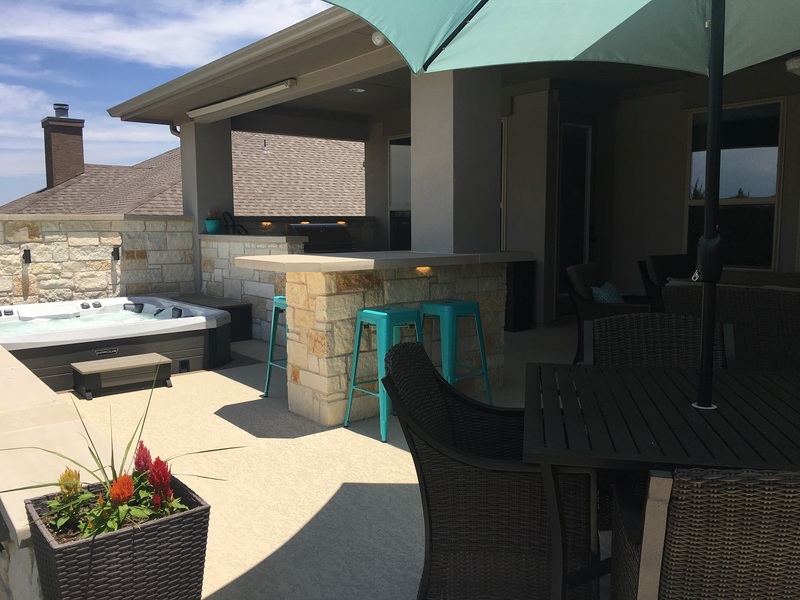 The homeowners had found the house they wanted to purchase, but they were not satisfied with the builder-grade covered patio at the back of the house. 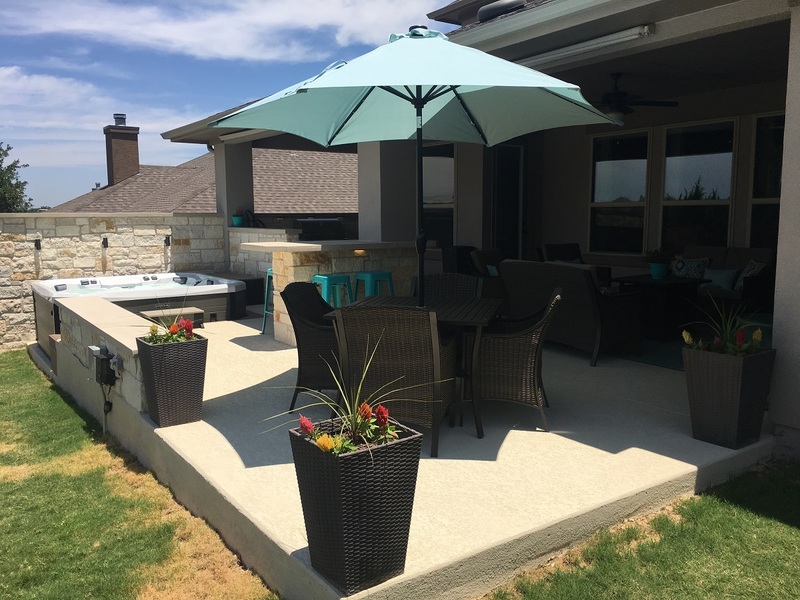 They wanted a custom outdoor space designed by Archadeck of Austin to make their new home complete. This builder’s patio wasn’t as tiny as some—trust me, we have seen some tiny builder-grade patios—but it didn’t make enough use of the available space in the back yard. The yard wasn’t deep, only about 30 feet to the fence. The homeowners felt they would make better use of the space if more of it was allocated to the patio than the lawn. The scope of our project here was to extend the patio farther out into the yard, add a recessed hot tub space and add an outdoor kitchen. To tie it all together, we designed a privacy wall behind the hot tub and the outdoor kitchen, which both border one end of the patio. We built a low seating wall at the back of the patio, and in the middle we added a high counter with bar seating for four. 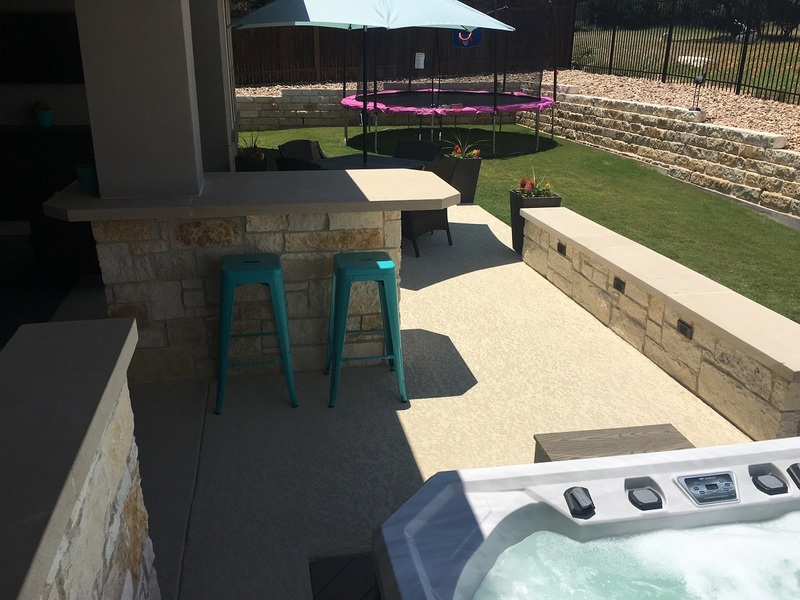 We built a recessed concrete area for the hot tub about a foot lower than the patio surface. 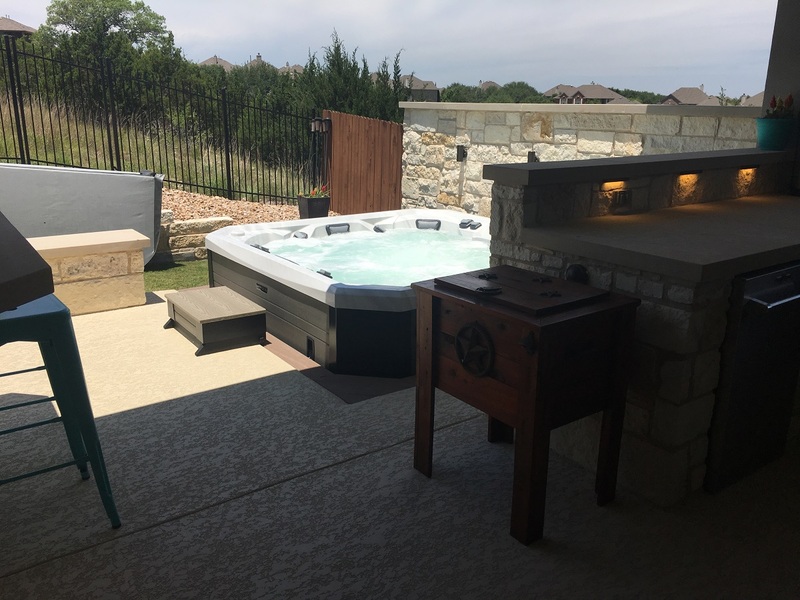 To keep the hot tub’s access panel accessible, we designed a special surround on two sides of the hot tub using AZEK low-maintenance decking boards. The boards are removable in the event someone needs to reach the access panel. Otherwise, the recessed concrete area would have blocked the access panel. The beautiful stonework on the hardscape vertical surfaces is white limestone chop block with heavy touches of nicotine. The counters and tops of the kitchen backsplash, seating wall and privacy wall are buff-colored Lueders limestone, always a favorite. Not to be overlooked amidst this project is the outdoor lighting, all of which was provided by Archadeck’s sister company, Outdoor Lighting Perspectives. Most of the lighting fixtures here are small and are not meant to be noticed; they just provide a bit of light where it’s needed. You may see the sconces mounted on the privacy wall beside the hot tub. Smaller light fixtures are mounted along the back of the kitchen counters, under the counter with bar seating, along the low seating wall and along the privacy wall in the grill area. 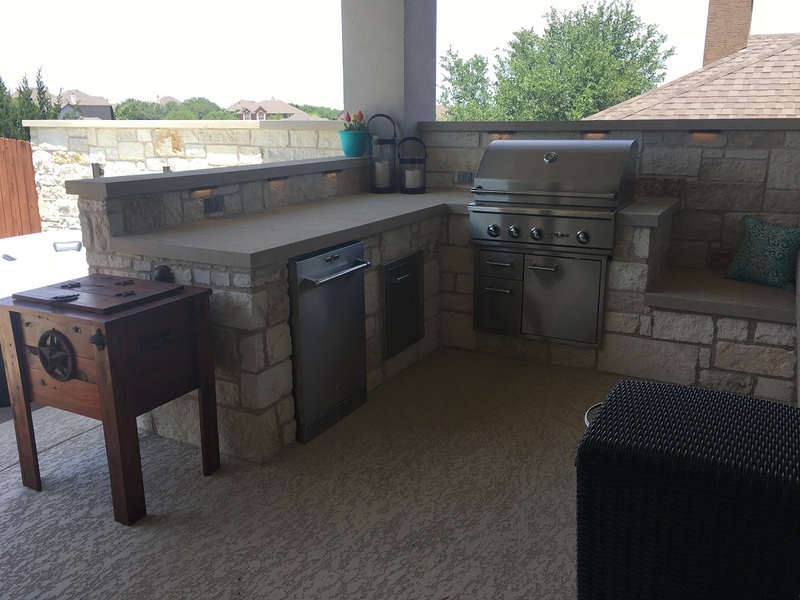 Kitchen fixtures provide task lighting for convenience, while other fixtures provide subtle yet essential lighting to create a relaxing mood and increase safety on the patio. The finished project is laid out as four specific areas. The original patio area, covered by the roof, contains the outdoor kitchen on one side and an ample space for comfortable seating on the other side. Along with the comfortable furniture, the homeowners have mounted a large TV screen on the wall for big game days and family movie nights. 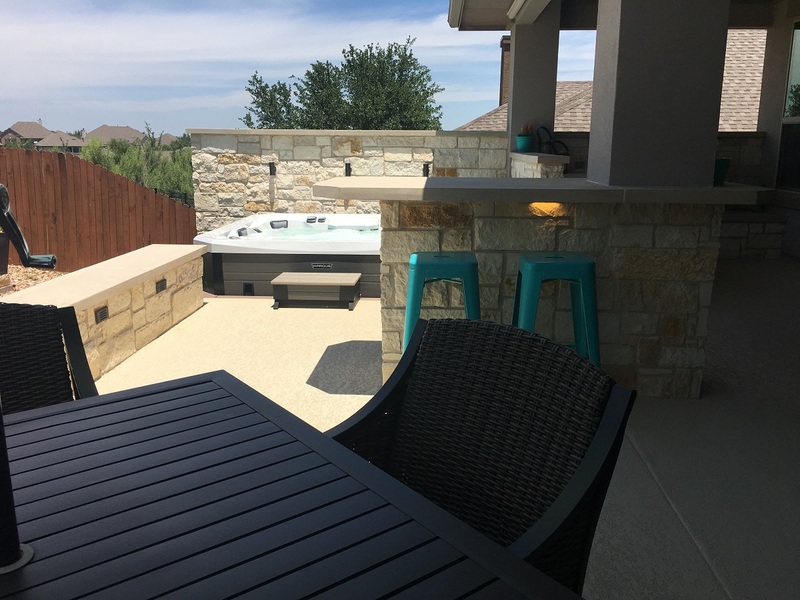 The extended portion of the patio, which is not covered, includes the hot tub on one side and a dining table with a huge umbrella on the other side. The homeowners will always have the option of staying in the shade when they want it and sitting out in the sun when it’s not too hot. With that large umbrella over the dining table, no diners will have to eat in the sun on this patio! 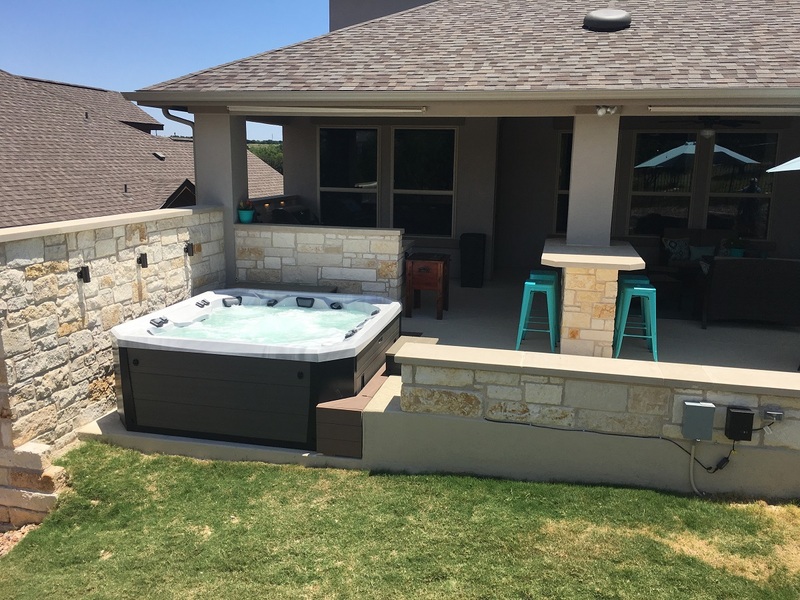 If you would like to learn more about extending your patio and adding amenities like a hot tub and outdoor kitchen, contact Archadeck of Austin today at (512) 259-8282 or via email at [email protected] to schedule a free design consultation.